Narration: Don Diehl is a science teacher at Fairview Elementary School in Denver one of the schools which takes part in the Integrated Nutrition Program. The school is located in the Sun Valley Neighborhood and every day nearly 300,000 cars pass by on I 25, just a stones throw away from the school. With the skyline of downtown Denver in sight, there’s asphalt as far as the eye can see?.. Sounds of hose watering plants? Right now Don is in the pumpkin patch. Don: ‘Cos what we saw the boys doing earlier, they were just watering like this, where they had the sprinkler going and they were just spraying it back and forth and it’s going on top of the leaves and then they move over here and they’re doing this and it’s not getting to the roots at all underneath, and it’s not long enough at all. Don: And that’s each night? Don: Are you up in the mornings? Don: Check at nine o.k., I?m serious, every day at nine, you need to check over here and see if the ground is still moist if it looks like this don?t water, but if it’s dry you need to water again. Narration: Fairview Elementary goes one step further with its nutrition program. 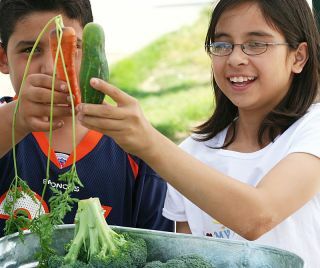 Denver Urban Gardens partner with the nutrition program to teach the students the benefits, nutritional and otherwise, of growing their own fresh vegetables. Judy Elliot is education coordinator with Denver Urban Gardens and has been teaching the nutrition gardening program at Fairview for nearly 6 years. ?the whole goal of the program is obviously to introduce children to a healthier style of eating, to get them to identify a diversity of vegetables with which they may not be familiar and to demystify that whole process. Narration: Fairview Elementary School is an unlikely venue for a market garden. The average household income is about ? of the Denver metro average and has one of the highest crime rates in the city. The school garden is an oasis in the midst of this challenged neighborhood. As Judy Elliot explains, for many students and their families this program represents the only opportunity they have to garden. we’re dealing with youth most of whom live in a housing project so unless they’re growing something in a little container right at their house? so it’s not a matter of being able to have their own back garden, it’s also a community where there is no grocery store available, such as a King Sooper or Safeway within walking distance. So when you’re bombarded with fast food all the time, all we can do is provide a place and instruction and incentives for kids to stay involved in the program long enough that hopefully we have planted a seed for a little thing they can do in their own lives differently. Narration: Denver Urban Gardens believe that community gardens are not just for growing vegetables. They are taking part in a 3 year research project called ?Gardens for Growing Healthy Communities?, which assesses the health benefits of community gardens. Their research demonstrates that a public garden in a community can instill self-sufficiency and pride in a neighborhood, and can often reach across hard to breach cultural barriers. Science teacher Don Diehl. Don: We have several families from Somalia who have started working with us this year, and we have 2 Vietnamese families that are growing their own garden here with us, and one grandfather that comes up from Mexico once or twice a month and he’s actually working with his grandsons that live right here too, it’s his pet little garden with his grandsons. Narration: As with the Integrated Nutrition Program, the Garden Project tries to reach out to families and the community through the children. While few parents volunteer in the garden, many come to purchase fresh vegetables at the farmers market, operated by the students on Sundays during the Summer. Narration: Oscar and Cesar are 8 year old twins and students at Fairview. Their mother regularly comes to the garden to get fresh ingredients for dinner. Maeve: What are you guys going to use the cabbage for? Oscar: Squash and carrots and onions. Maeve: Are the vegetables here better than at the store? Narration: Back at the pumpkin patch, Justus gives a guided tour. Justus: When it comes?when they’re done, we store them for Halloween, and if it’s like Halloween is already past and they already grew like right now, what we do is, we keep them stored in a cooler and that way when it comes to Halloween they?ll be ready?nice and fresh. Narration: the students involved in the garden learn about much more than nutrition. For many it teaches them responsibility and team work and offers them an escape from what can be in this neighborhood, the harsh realities of day to day life. As Justus explains, the garden offers her a sanctuary, somewhere she can work out her problems while tilling the soil, and relieve her frustrations by pulling out weeds. Justus: See like me, I’ve gotten all my stress away, so I?m ready for school?. Narration: Justus went onto middle school this year, but will continue to work in the garden even though she no longer attends Fairview. So with many of the students graduating and moving on, what will happen to the next generation of Fairview students? Tune in to hear when we meet the new generation of urban gardeners in the next installment of eat your greens.